In many ways, the German shorthaired pointer is the quintessential sporting dog, as they excel in just about every hunting context imaginable. However, while they’re certainly popular among sportsmen and sportswomen, German shorthaired pointers also make good pets for families that are willing and able to provide the things these lovable, high-energy dogs require. 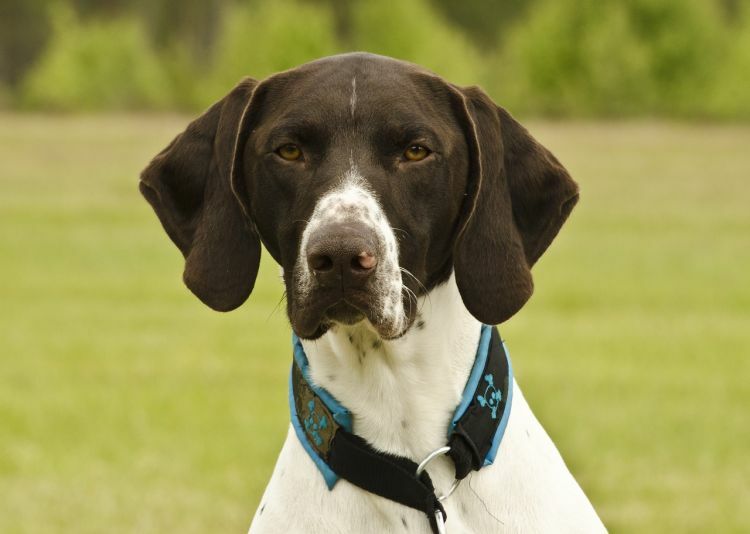 We’ll talk more about German shorthaired pointers below, including information about their physique, personality, history and the common health concerns of the breed. This will hopefully help you decide if a German shorthaired pointer would be a good fit for your family. German shorthaired pointers were initially developed to be an all-around hunting dog, who could perform a variety of different tasks. Spanish pointers and bloodhounds both appear at numerous points in their family tree, and these influences can still be seen in modern GSPs, given their work ethic and strong nose. The first German shorthaired pointers are thought to have been bred in Germany in the late 1600s. But while they were quite popular in Europe over the following years, they only made their way to the U.S. in the 1920s. They gained AKC recognition soon after, in 1930. German Shorthaired Pointers are essentially Lab-sized dogs, but, when compared side-by-side, the GSP is often slightly taller and leaner. They usually stand about 2 feet tall at the shoulder and weigh 45 to 75 pounds. As with most other breeds, male GSPs grow slightly larger than their female counterparts. 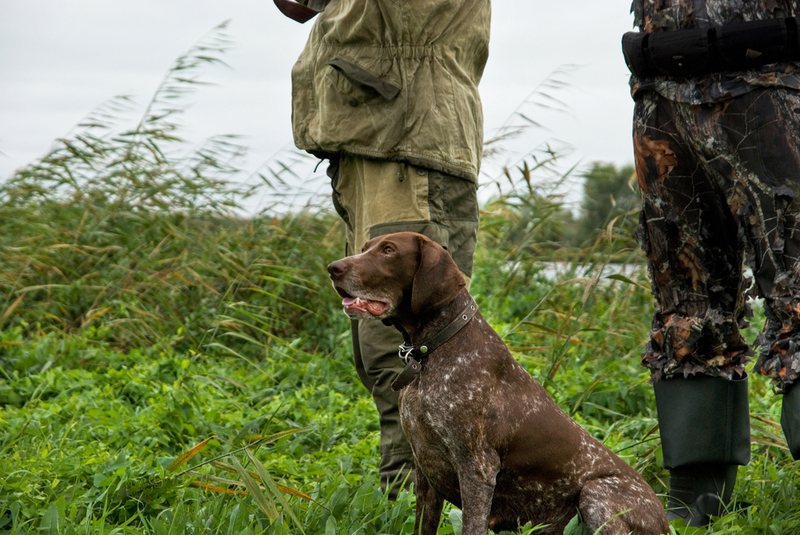 Traditionally, German shorthaired pointers have their tails docked. They’re normally kept at about 40% of their unaltered length. However, there is no reason to dock your GSP’s tail if you don’t want to. Generally speaking, German shorthaired pointers are friendly, affectionate and good-natured dogs. They usually bond strongly with their families and prefer spending the bulk of their time with their “pack.” In fact, German shorthair pointers do not tolerate being left alone for long periods of time. They not only feel stressed when separated from their families, but they also get bored easily. This invariably leads to destructive behaviors. German shorthaired pointers are slightly skittish around strangers, but when given time and space to familiarize themselves with unfamiliar people, they usually make friends readily. They’re fantastic with family children, but they can be skittish around kids they’ve not yet met. German shorthaired pointers get along with familiar dogs relatively well, especially when they’re of similar size. They may, however, be extremely aggressive toward cats or small dogs, given their high prey drive. They are also prone to howling and barking at even the most minor disturbances – these are not good dogs for those with noise-averse neighbors. 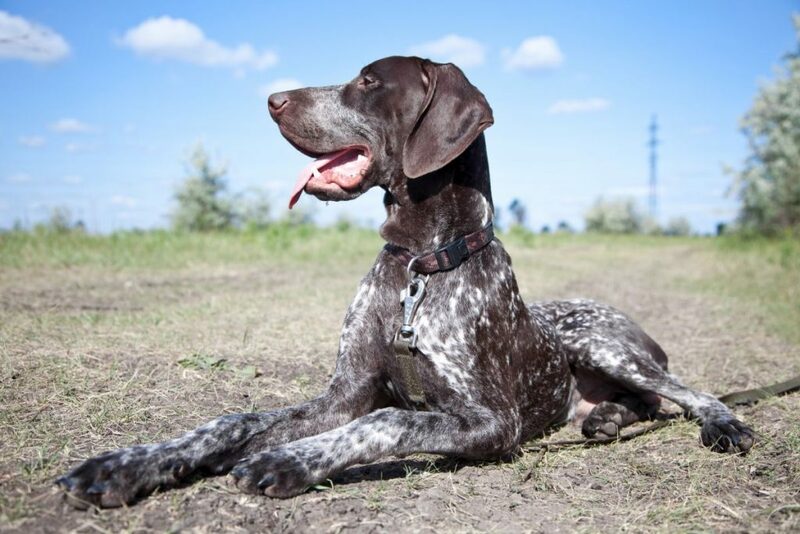 German shorthaired pointers are often healthy and live long lives, but the breed is susceptible to a number of mild to serious health problems. You can avoid some of these by only purchasing German shorthaired pointers from breeders who implement strict health-screening protocols in their breeding programs, but others are not easy to avoid by any means. Nevertheless, it is important to familiarize yourself with some of the most notable health problems that afflict German shorthaired pointers. Entropion – Entropion is a condition in which a dog’s eyelids roll inward, causing pain and discomfort. Entropion usually manifests by the time your dog is 6 to 8 months of age, and it can be corrected surgically. Hip Dysplasia – Hip dysplasia occurs when a dog’s hip joint develops improperly. This leads to pain and inflammation in the joint, which can eventually reduce your dog’s quality of life. Hip dysplasia is often treatable, but it often requires expensive surgery to correct. 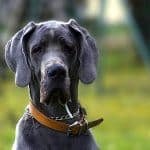 Cancer – Unfortunately, German shorthaired pointers appear to be more likely than many other breeds to suffer from cancer. The best way to help protect your dog is to pay close attention to his health and visit your vet frequently so that any cancer that develops can be treated aggressively. Bloat – Bloat occurs when a dog’s stomach fills with air and twists on its axis. Without treatment, bloat is almost always fatal, so you’ll want to do everything you can to help avoid it from happening. 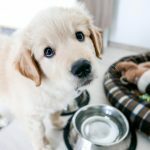 In addition to feeding your dog small meals spread out through the day, you can use a feeding dish designed to slow your dog down at dinner time. For the most part, German shorthaired pointers are pretty easy dogs to care for and they don’t present any serious care challenges. We’ll talk a little more about the things you’ll need to do to care for a German shorthaired pointer below. 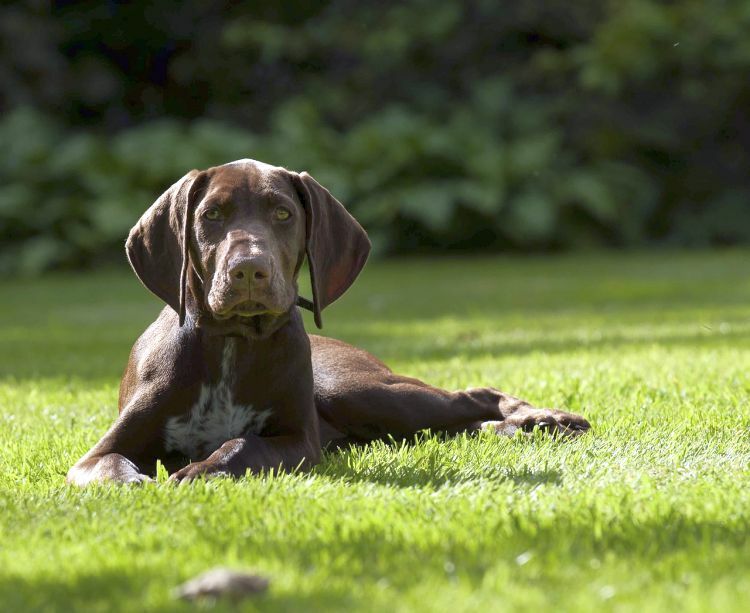 German shorthaired pointers will usually thrive on just about any high-quality dog food that meets the AAFCO guidelines. However, because they are “tweeners,” who may or may not be considered “big” dogs, you’ll want to discuss your choice of food with your vet. The issue is that large dogs (and puppies who will become large dogs) have slightly different nutritional needs than small and medium-sized breeds. For example, the calcium and caloric content of large-breed dog foods often differ from those designed for smaller breeds. So, you’ll want to discuss the subject of food with your vet before making a choice. 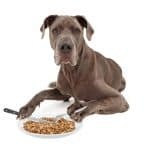 If you do decide a large-breed dog food is right for your pet, be sure to check out our comprehensive review of the subject to see some of the best options available. Providing a German shorthaired pointer with enough opportunities to exercise is likely the most challenging aspect of their care. A couple of 20- to 30-minute walks a day won’t suffice for these high-octane dogs. German shorthaired pointers are high-energy canines who need a minimum of one hour of play time every day, and most would be happier still if given the chance to run around for twice this long. Ideally, you’ll have a large, securely fenced yard that gives your new pet plenty of room to roam. If not, you’ll need to be willing to load your new pet in the car and head to the dog park every day. If you fail to provide constructive ways for your GSP to burn off some excess energy, depression, frustration and destructive behaviors are essentially guaranteed to manifest. Fortunately, it’s not hard to get a German shorthaired pointer some exercise, as they love to play in a variety of different ways. Most German shorthairs love to play fetch, and they generally love swimming too. Most also love wrestling and playing with other dogs with whom their familiar. 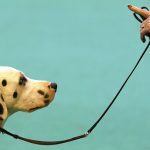 All dogs must be housetrained and receive basic obedience training. The former is important for obvious reasons, and the latter will help keep your dog well-behaved and safe. Fortunately, German shorthaired pointers are very smart dogs, who are generally very easy to train. Go ahead and start housetraining your new pet as soon as you bring him home. A crate will help in this process, and it’ll also prove helpful in a number of other circumstances, so make sure you pick one up as soon as you adopt or purchase your dog. As long as you dedicate yourself to the task and remain consistent in your approach, you should be able to housebreak your new pet in a few short weeks. Although you can start housebreaking your German shorthaired pointer as soon as you get him, you’ll want to wait to begin basic obedience training until he’s about 7 or 8 weeks of age. Start with simple commands, such as “sit” and “lay,” and work up to more complicated tasks as he learns. German shorthaired pointers have minimal grooming requirements. Their hair isn’t long enough to brush in most cases, although you can always do so to knock some of his soon-to-be-shed hair off while you’re outdoors – your pet will probably enjoy the process too. That said, German shorthaired pointers don’t shed very heavily anyway. You’ll also need to keep your pet’s teeth brushed and nails trimmed. Start performing these tasks while your pet is young, so he will get used to these procedures and accept them as a normal part of life. You’ll also want to bathe your pet about once a month or so, as well as anytime he becomes dirty. Most GSPs love the water, so they rarely protest bath time very much. German shorthaired pointers may not be as popular as German shepherds of Labrador retrievers are, but they are a relatively common breed. This means you shouldn’t have too much trouble finding one for your family. You may be able to find a German shorthaired pointer to adopt, although you’ll likely be limited to older animals. There are German shorthaired rescue organizations in most parts of the U.S., so you can start your search by simply Googling rescue groups in your area. However, the National German Shorthaired Pointer Rescue is a great resource no matter where you live, and they service all areas. On the other hand, if you’d like to purchase a German shorthaired pointer puppy from a breeder, you may want to check out the AKC’s Puppyfinder. Prospective dog owners often have a number of questions about their new pet, no matter what breed they intend on adding to their family. 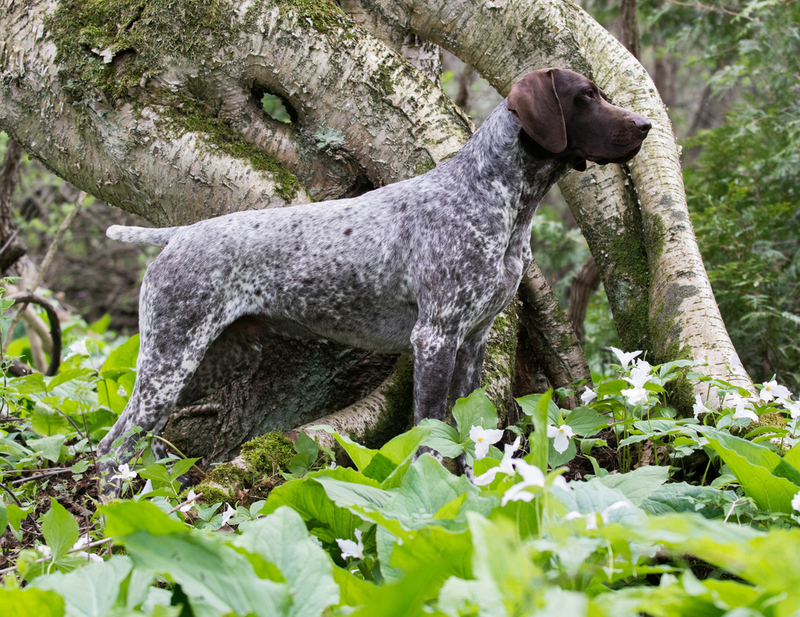 We can’t answer all of the questions people may have about German shorthaired pointers, but we will try to address a few of the most common ones below. Are German shorthaired pointers hyper? “Hyper” or “hyperactive” may not be the words we’d choose to describe this breed, but German shorthaired pointers are undoubtedly high-energy dogs. They aren’t a good choice for owners who simply want a dog that’ll lounge around on the couch. They need one to two hours of exercise every day to remain healthy and happy. Provided that they are properly socialized and trained, German shorthaired pointers are usually good with children. They’ll certainly make great playmates for family kids, but they may be a bit shy around unfamiliar children until they get to know them. Nevertheless, supervision is always required, as large dogs may injure children accidentally. Are German shorthaired pointers protective? German shorthaired pointers are vocal dogs, who won’t hesitate to bark at anything unusual or that they perceive as threatening. However, they’re unlikely to physically intervene in emergency situations. Are German shorthaired pointers smart? German shorthaired pointers are very intelligent dogs. They’re usually easy to train and they require plenty of mental stimulation to remain happy and enjoy a good quality of life. 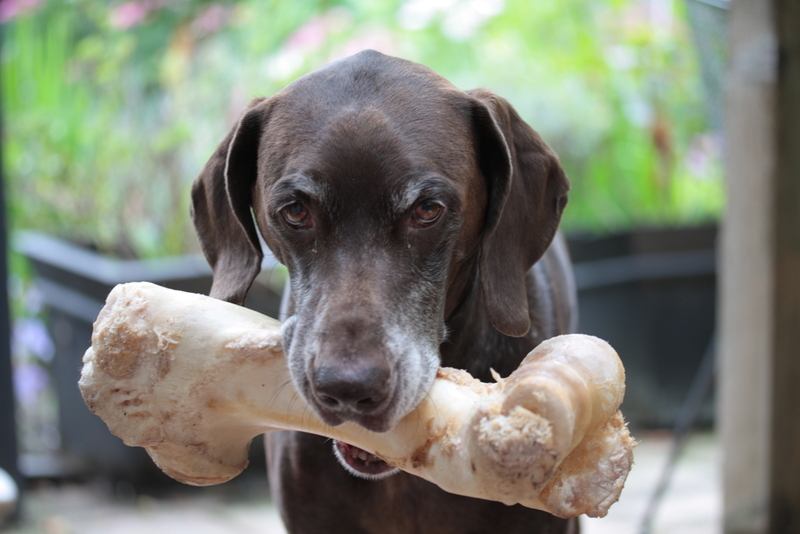 Do German shorthaired pointers shed a lot? All dogs shed, including German shorthaired pointers. However, GSPs don’t shed very heavily and they have relatively short coats. Accordingly, they may make a good choice for owners who have allergies or simply want to maintain a tidy home. Do German shorthaired pointers like to swim? All dogs are individuals, who exhibit their own preferences and personality quirks, but most German shorthaired pointers love to swim. In fact, this is a great way to give your pet exercise, as it burns a ton of calories, yet doesn’t cause the wear and tear on a dog’s joints the way some other types of activity do. Wrapping Up: Is a German Shorthaired Pointer Right for Your Family? German shorthaired pointers are fantastic dogs, who have a lot of great traits – there’s a reason they’ve become the AKC’s 11th most popular breed. They are sweet, loving, loyal and gentle, and they are one of the most playful breeds in the world. German shorthaired pointers are generally healthy dogs, and they don’t present very many serious challenges for their owners. They also get along very well with kids in the family (as well as other children they’ve had the chance to meet) and make great companions for families on the go. 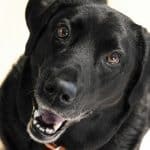 It is important that you think carefully about your ability to provide sufficient exercise for these dogs, as they have energy levels that are truly difficult to appreciate until you’ve met one in person. In fact, some authorities discourage first-time owners from selecting this breed, as they can become quite challenging if not provided with appropriate amounts of exercise. But if you are sure that you’ll be willing to keep your GSP well-exercised and stimulated, they can make a great choice for many families.